Hand made pyrograph picture frame! 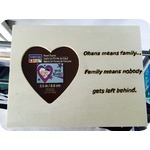 has the quote "ohana means family...family means nobody gets left behind." Perfect for a gift! 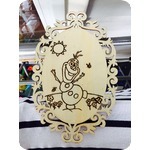 Hand made pyrograhph picture of the little snowman himself...Olaf! Perfect for the frozen fan in your life! Has glitter around the edges, as well as a gloss coat over top! 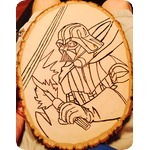 This is a handmade pyrograph picture of Darth Vader! Perfect for the Star Wars fan! Has a gloss coat over top for protection and shine!